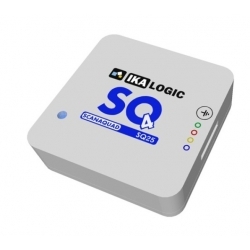 ScanaQuad (SQ) is a series of high performance 4 channels logic analyzers and digital pattern generators. They are designed to be your best companion when working on serial protocols like UART, SPI, I2C, 1-Wire, USB, I2S, CAN, LIN, RS232, RS485, and more. With ScanaQuad Logic Analyzers, you can capture signals, you can play them back, and you can even build genuine test signals and generate them! 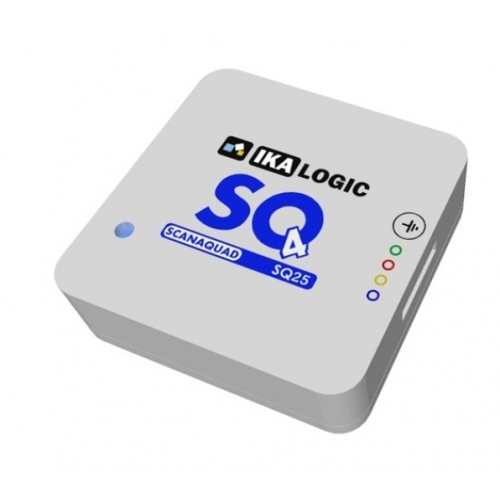 Being able to capture and generate logic patterns simultaneously with the same tool, is extremely useful when debugging Logic signals, and it only comes with ScanaQuad. Comes complete with a set of probes and a USB cable. Ability to trigger on specific protocols (like a UART word or an I2C address). 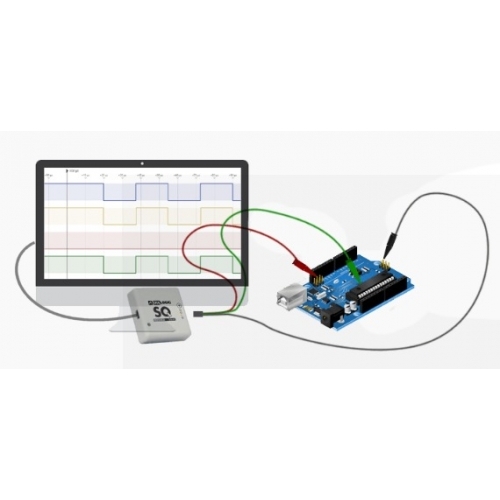 Precise control over loop point or ability to generate arbitrary signals on any number of channels while recording the result on the others. ScanaQuad input/output stage is fully protected while offering flexible options like Open Drain outputs and configurable pull up/down resistors. The digital signal generator has an output voltage of 3.3V. ScanaQuad was designed to be the ultimate 4 channels logic analyzer and signal generator on the market. regular and overdrive modes and warn you in case of irregularities. 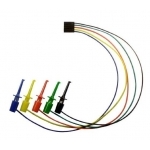 1-Wire Temperature Sensors decoder. Supported sensors: DS1820, DS18B20, DS18S20, DS1822, DS1825, DS1920, DS2438, DS2760, DS28EA00, MAX31820, MAX31826 and MAX318(50/51). CAN frames. It will also display stuffed bits, calculate checksum and compare it against the one given in the frame. for humidity and 2 bytes for temperature. Data is stored in 10th deg and %. DMX-512 Protocol Decoder. A standart decoder of unidirectional DMX-512 differential interface commonly used to control stage lighting and effects. I2C Protocol Decoder. A standard decoder of Phillips (NXP) multi-master serial single-ended computer bus. Maple Bus Maple Bus Protocol Decoder. MIDI MIDI (Musical Instrument Digital Interface) Protocol Decoder. sonars, anemometer, gyrocompass, autopilot, GPS receivers and many other types of instruments. Parallel Bus Generic Parallel Bus Decoder. This decoder script will interpret 1 to 8 data lines as a 1 byte bus. PWM Decoder. A decoder of pulse-width modulation, or pulse-duration modulation signal. Highly configurable SPI bus decoder. WIZnet W5100 SPI decoder/debugger. Decodes SPI traffic on the SPI bus between an MCU and the WIZnet W5100 Ethernet. UART Serial UART (Universal asynchronous receiver/transmitter) Protocol Decoder. Waveform area: This rectangle shows the actual logic signals and allows zooming and panning via simple mouse clicks. Side Panel: This is where different configuration panels appear. For instance, device or decoders configuration panels appear in this zone. Top toolbar menu: This menu hosts buttons for the most common actions that a user can take to capture signals, measure it and analyze it. Device status: This section displays the status of the device (the one attached to this workspace) as well as the progress of an operation (if an operation is underway, like capturing some signals, or parsing some data). Hint box: This part is used to show some hints according to what the mouse is pointing at. Cursor time: The zone always shows the exact time under the mouse cursor. 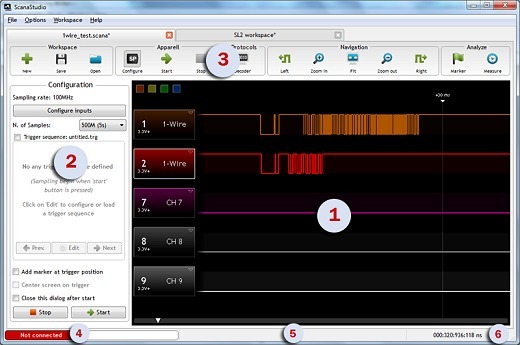 Generate signals with ScanaQuad Logic Analyzer in 5 Minutes! Creating your own protocol decoder in 5 minutes!